Yes, I agree with the next-to-last paragraph the most: fortify your own retreat, but also convince your neighbors to fortify theirs as well…so that the word gets around that your ‘area’ is one to be avoided! Why would a bunch of urbanites, uncomfortable around cows, owls & crickets in the dark, want to mess with “those crazy hill people with guns”, when there are miles and miles of nice, open suburban houses to loot in between? Hopefully they (the looters) will decide we are all just a bunch of ragged hillbillies with not enough to be worth taking anyway, and not worth the trouble. Second, surveillance… solar powered cameras (transmit & receive wireless signal & audio) are common enough. There are numerous means and methods to maintain early warning (ideally, several methods at each layer of your defense), alarms, dogs, booby-traps, trip-flares… neighbors, LP/OPs… and I have an electric-powered UAV with real-time cameras down-linking to me (all cameras I have are day/night and IR) with a range of 3 miles and loiter-time of 4 hours. 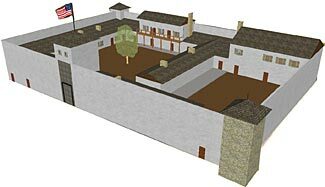 Third, the mobile defense or use of a IRF (immediate reaction force) to flank and engage (day/night capable) an attacker while the “homestead” is defended. Don’t be so glum. One thing you should study is CofG. That’s Center of Gravity. If I take this away (destroy or disable), this key asset from the BGs, then they lose the will to fight. That may be there leader… it could be their motorcycles; depending on the type of threat… you have to understand the type of threat, their goal/target, tactics, methods and means. Simply, you make the price too high to mess with you. This leads to another issue – what are you going to do with prisoners? What will you do with wounded/injured BGs?? Thanks for your comments; sorry to be slow replying to them. It is great to have a different perspective here to help people pick and choose the bits that make most sense to them and select those that fit best into their own retreat scenario. But, having said that, we come from different perspectives, I think, and while you raise some points, you don’t answer my questions – in particular, how many people will you need for your security detail? You also talk about OPSEC. To me this is a fancy word but which means little/nothing in real life, and is all too often used by people trying to hide behind the term rather than confront the specific details of what it means. For example, how do you ‘appear to have nothing of value’? If you have shelter and food, you’ve got things of great value, and the marauding bad guys (at least we both agree they will be an issue) will be keen to ‘share’ anything and everything with you. If you have cultivated crops, livestock, a water supply, anything like that, you have things of great value. If you have a homestead, you again have something of value to a homeless marauder. How will you hide acres of crops? Livestock? A windmill? And so on…. Surveillance is fine, but that doesn’t prevent your need to potentially defend yourself, it just gives you warning to do so. Oh – and that electric powered UAV (please tell us more – make and model and source) sort of flies in the face of trying to appear like you have nothing of value! I love high-tech, and surround myself with a great deal of it. But I’m not going to base my future retreat survivability on high tech solutions. Sooner or later, the high tech will fail – maybe sooner in the case of an EMP strike, maybe sooner in the case of random bad luck, or casualty damage, and what happens then? I’ll use high-tech aids as much as possible while they’re available, but I also have a very low tech backup plan for when the high tech finally fails. Your third point seems to fully support my contention that a retreat must be defendable, and the same with your center of gravity thing. But – ‘making the price too high to mess with you’? I’m not entirely sure what that means, and you seem to be advocating pre-emptive attack, which is a difficult strategy to ‘sell’ to the authorities when/once law and order are restored. Your last question about wounded and detained bad guys is a sensible question to ask, and everyone will need to have their own prepared response. If you injure an attacker, does that then make you responsible to care for his injuries? Some might argue yes, others might argue no. If you detain an aggressor temporarily, can you imprison them longer term? If you do, have you just ended up giving them ‘free room and board’, or is there a way you can put them to work and get compensating value from them? But if you do put them to work, have you just made them into a slave? What legal right do you have to detain people, let alone then put them in work gangs? Lots of questions and issues – some moral, some legal. It is good to raise them, thanks again for your comments. If this is what he’s talking about, I think you both have good ideas. Yeah, hard to do. If you want to go for this, the more rural the better. Some terrain can help very well with this, although I think it is hard to find. Rather than having rows of crops, you’ll want to go for an inconspicuous survival garden. The fewer animals, the better. Having as much of your ‘stuff’ underground as possible is helpful. Using bushes and other natural surroundings are helpful. Camo netting is helpful when bushes don’t work. It would be very bare bones, but I think it could be done in a way that no one will find you. However, it would need to be a small group. It’s not as possible with a larger group. All I could really add to this concept would be to hide your goods and make it look like you don’t have anything. I think this concept has more appeal for when you are away from your home base and if you run into people, you can pretend you are a nobody with no possessions and living off insects. At the home base, I wouldn’t want potential enemies to get close enough to snoop around. I kind of see this as the post collapse predicament. You want to see out, but don’t want them to see you. If we think of this from a woods scenario, you can clear cut an area around you to see out, but that will also mean, people coming by will have a better opportunity to discover you and spy on you. As I thought about this, I figured that small groups should attempt to remain hidden in the woods, whereas larger groups with good defenses can clear cut an area to have better surveillance. Do you agree with that? I’m not sure about having guys patrol the perimeter. I’m thinking alarm systems is best and maybe some LPOPs. Perhaps the perimeter could be clear cut in straight lines on the sides, so a person could be posted on each of the 4 corners (or 2 opposite corners only), and they could also do double duty as they hunt from that position. I don’t have any military experience, but I’m not sure that sending guys outside the fort to engage the enemy on neutral ground is a good idea. I feel like if your fort has good defenses, why not just have the enemy come to you if they want a battle? Even a fort built post-collapse could have breastwork, abatis, punji sticks, a moat, and thorn bushes all the way around. (a lot of shovel and axe work, but it could be done) I would much rather make my stand there with all my men. And then an escape tunnel or escape route is helpful for the worst case scenario. If anybody’s interested, I wrote blog posts that address some things in this article: “Choosing a Bugout Location” (ideal terrain to see out, but not let them see in), “What to do When You See Other People in a Collapsed Society”, “10 Punishment Options in a World WROL”, “Defense Features for a World WROL,” “Types of Fortifications Throughout History”, and “Defensive Barriers in a World WROL”. Choosing the Ideal Prepper Pistol Part 1 – Intro and Most Important Selection Criteria Retreat Design Considerations – How Many Levels Should it Have?